Broadway is strewn with adaptations from all avenues of pop culture, both successful and unsuccessful. “Once” was adapted for the stage from the 2006 film by the same name, which won an Academy Award for Best Original Song. The movie tells the story of Guy and Girl, an unnamed man from Dublin and the Czech woman he meets and bonds with over a love of music. Although the film features many musical numbers, most viewers would not classify it as a traditional musical. The songs in the film, written and performed by Marketa Irglova and Glen Hansard, are quiet, folksy and organic to the story, seamlessly blending with the plot, which focuses on Guy and Girl collaborating on music together. Hansard and Irglova performed with each other under the name The Swell Season prior to writing the music for “Once,” so their on-camera chemistry is realistic and raw. As a whole, “Once” the film is a very naturalistic movie. Broadway musicals, however, are not stellar examples of naturalism, which makes “Once” onstage a very different experience for fans of the film. “Once” was wonderfully successful as an adaptation on Broadway, winning the Tony Award for Best Musical when it premiered in 2012. Although I did not see the Broadway run of the show, it appears that the Philadelphia production at the Academy of Music has not changed too much, including the show’s opening. When the audience arrives, they are encouraged to climb onto the stage, ramble around the Irish pub set and grab a drink from the bartender behind the real bar. Later, as the crowd thins, the show discreetly begins with the cast playing music as if the audience were peeking in to a real Dublin pub. As a nontraditional musical, it only makes sense that “Once” begins so casually. Unfortunately, this means that the first few unofficial numbers are accompanied by patrons getting seated and settled, unaware that the show is beginning. On the other hand, this slow start mirrors the haunting theme of “Once,” that life is not a series of clean ends and beginnings. Some things start and end without us even realizing when or why. The music is as hauntingly beautiful as its theme. The actors play their own instruments throughout the musical, lending an air of realism to each performance. 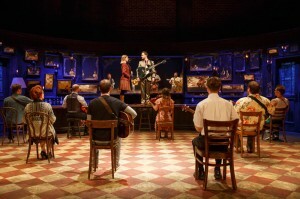 “Falling Slowly,” the show’s most popular song and its award winner, is positively enchanting on stage. The way Guy and Girl, played by Stuart Ward and Dani de Waal, respectively, begin their delicate harmony and are slowly joined by the rest of the cast’s many instruments captures the magic of the original recording. There’s a noticeable shift, though, in the quality of the songs from those created originally for the musical. The stage version of “Once” puts a great deal of focus onto secondary characters that receive their own songs. The magic happens between the main characters, so the many deviations from their plotline feel a bit exhausting over the course of the show. “Once” is a great show for music lovers. The musical numbers are concert quality, both vocally and instrumentally. To create this effect, it seems like the production at the Academy focused on casting great musicians rather than actors. The show is packed with jokes and physical humor, but the execution is not very successful. Billy, a character played by Evan Harrington, boasts much of the physical humor of the show, but many of his skits come off as corny. Even the chemistry between Ward and de Waal makes their romantic-comedy scenes feel forced. What would be humorous scenes with great comedic actors become uncomfortable intervals between high-quality musical performances. This problem may be due to traditional musical comedy leaking into the script, but it felt like the show could have been better with different actors. 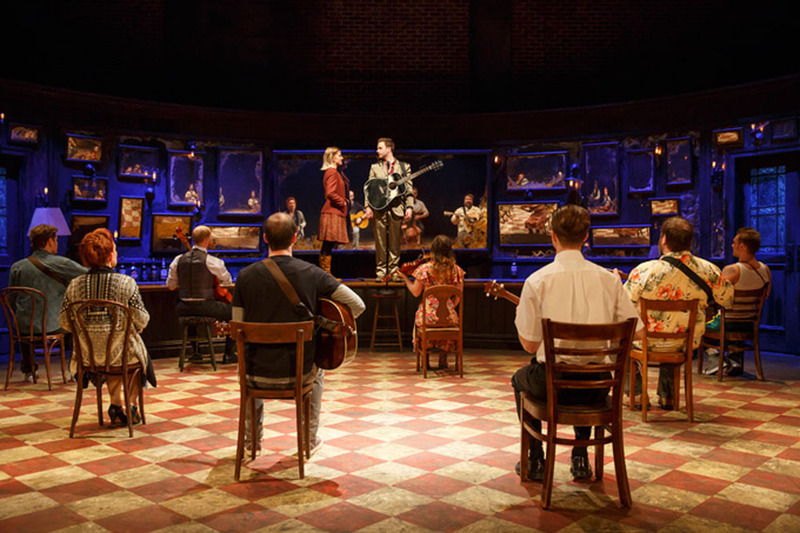 Despite its comedic pitfalls, “Once” is worth visiting for the musical performances alone. For fans of the film, the broad and flashy stage production will be a bit of a shock compared to the naturalistic film. Anyone who approaches the musical expecting a typical Broadway production with a folksy spin will be pleasantly surprised by a unique story. “Once” is running only until Nov. 10, so catch it before it leaves the Academy!